The Greatest Movie Ever Made – rewatched. And the verdict is- it stays so. And hence, it should not be reviewed. I saw it again. On big screen. In 3d. And it didn’t change a damn thing. 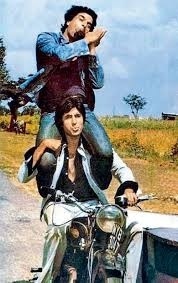 Sholay is mindblowingly awesome fun. You know every scene, every dialogue, every twist and turn. You know the funny ones and the poignant ones. There are no surprises. Yet, you long for the Jai-Radha romance once again. Yet, you laugh at Basanti’s yun ki once again. Yet again you fall in love with Gabbar. And Imam Saheb- itna sannata kyun hai bhai. The death of Ahmad still affects. And you still shed a secret tear when Jai dies. You still remember the susaad of veeru, and the haath-nahi-faansi-ka-fandaa-hai wala thakur. You are wont to concede that mehbooba mehbooba is one of the finest item numbers of all times. And Soorma Bhopali and angrejon ke jamaane ka jailor are the most important shortest comic acts of all times. Jaya might have delivered one of the finest silent scenes of all times. And Sambha probabkly is the most iconic sidekick of a villain ever. With just one dialogue in the movie! And you secretly (or vocally) mouth all the dialogues. What can one say about this movie that hasnt been said before. I spent another 3hours+ trying to find flaws. I managed to find one.